Written by Wilton Kee on 8-Jun-2016. 1. It is applicable to any types of boards with any pre-defined connections between intersections for stone placement. 2. It is applicable to any number of players (even 3 players or more). 3. A game always ends in a finite number of plays, as long as the board is finite. 4. A game always ends by consecutive passes of all players, with each player passing once. 5. A game always ends with one single board for a definite score. 6. When a game ends, unless the player who placed the last stone is himself bounded by an immediate cycle prohibition, none of his opponent(s) shall be bounded by an immediate cycle prohibition. 1. A board consists of a pre-defined number of intersections, with each intersection connected to some others in a pre-defined manner. A usual board is marked with 19 parallel vertical lines and 19 parallel horizontal lines, making 361 intersections. The intersections are connected to some others by the lines. 2. Each player possesses one unique colour of stones with the number of stones sufficient to end a game. A usual game is played by two players, where lens-shaped black and white stones are used. A usual game starts with an empty board, where all intersections on the board are empty. 4. An empty intersection which is connected to a stone intersection is called the liberty of such stone. 5. If a stone intersection is connected to another stone intersection of the same colour, then these two stones belong to one single stone group and share the same liberty. 6. Similarly, if an empty intersection is connected to another empty intersection, then these two empty intersections belong to one single empty group. (b) pass play: doing nothing on the board. In a usual two-player game, the player with black stones makes the first play, and then the player with white stones, and then the player with black stones again and so on in alternation until the end of the game. 8. Capture Rule: Immediately after a stone play, if the liberties of any opponent stone is all taken away, then such opponent stone is removed from the board. 9. Suicide Rule: Immediately after a stone play, once the stones are removed under Capture Rule (if any), if the liberties of such stone play is all taken away, then such stone play is suicidal and all the stones in the same stone group are removed from the board. 10. A suicidal stone play which does not alter board position after the stone removal is disallowed. (b) At least one of his opponent(s) has only made stone play(s) since its first appearance. 12. When making a pass play, a player may choose to appeal if he can indicate a stone play he wants to make on the current board position but it is prohibited for him to do so due to Cycle Prohibition Rule. 13. A stone play of a player is rescinded if, before the next stone play, it is responded by an appealing pass play of at least one of his opponent(s) followed by his own non-appealing pass play. 14. Once a stone play is rescinded, the player has to reconsider another play to replace it and the game would restart from there. 15. Once every player has consecutively made a pass play on a board position, if the last stone play has not been rescinded, the game ends and would be scored based on such board position. 16. The game also ends when the ranking can be agreed by all players. (a) All dead stones are removed from the board upon agreement of all players. (b) Each stone intersection of a player on the board is counted towards one point of such player. Then each intersection of such empty group is counted towards one point of such player. (d) Any other intersections are not counted towards any point of any player. (e) The ranking is determined according to the total points possessed by each player. The higher is the total points obtained by a player, the higher is the ranking. John Tromp pointed out the peculiar consequences of superko rule if White does not connect in the lower left. Black can then use as the superko threat. With normal superko rules, White 11 ( ) is prohibited as it repeats the outcome of (in the previous diagram). All white stones are dead as the result. Under Kee Rules, White 11 is not prohibited because of , a non-appealing pass play. Instead, Black 12 to capture White 11 ( ) is prohibited, as it repeats the outcome of (in the previous diagram) but now all Black's plays in between are stone plays. Unlike John Tromp's sending-2-returning-1, White cannot even connect to remove the superko threat. Black plays as the superko threat, which is a one-sided irremovable ko threat only available to Black. With normal superko rules, is prohibited as it repeats the outcome of (in the previous diagram). All white stones are dead as the result. Under Kee Rules, is not prohibited because of , a non-appealing pass play. Instead, Black 9 to capture is prohibited, as it repeats the outcome of (in the previous diagram) but now all Black's plays in between are stone plays. White has two eyes but Black has only one. Can White capture all the black stones as we expect? Black captures the ko by . With normal ko rules, White's recapture is prohibited and the game will end there. It is not fair to White as Black does not resolve the ko when White is prohibited to make a stone play due to the ko. Under Kee Rules, White can make an appealing pass play. Then when Black attempts to pass to end the game, he does not have a reason to appeal, so will be rescinded and it can only be a non-appealing pass play. White can then capture all the black stones as we expect. Black has two eyes but White and Red have none (where Red stones are denoted by ). Can Black capture all the stones as we expect? After Black captures the white stone, Red can then capture the black stone because it does not repeat the board position. With normal superko rules, Black's recapture is prohibited and the game will end there. It is not fair to Black as Red does not resolve the ko when Black is prohibited to make a stone play due to the ko. Under Kee Rules, Black can make an appealing pass play. Then when Red attempts to pass to end the game, he does not have a reason to appeal, so Red's capture will be rescinded and it can only be a non-appealing pass play. Black can then capture all the stones as we expect. With normal superko rules, Black would capture all the white stones. I am going to show that it is the same under Kee Rules. After 's capture of 1st ko, White cannot pass as he has no eyes. After 's capture of 2nd ko, should continue to capture the 3rd ko. Again, White cannot pass as he has no eyes. After 's restoration of his only possible ko (2nd ko), should continue to restore his only possible ko (1st ko). Now White's restoration of the 3rd ko would repeat the initial board position, so White can only pass. Black would capture all white stones by capturing the 2nd ko. With normal superko rules, Black would end up capturing two out of three ko's. I am going to show that White would actually capture all black stones under Kee Rules. This is a fair outcome because White has one eye but Black does not. After 's capture of 1st ko, White's optimal play for would be an appealing pass play, allowing to capture all three ko's first. Now White's optimal play for would be to capture the 1st ko. Then Black 5 can only pass. Then White's optimal play for would be to capture the 3rd ko. here is prohibited, because it repeats the board position produced by , with being an appealing pass play (not a stone play). So again Black 7 can only pass. Finally, White can capture all the black stones by , leading to a fair outcome. With normal superko rules, Black would end up capturing two out of three ko's. I am going to show that it is the same under Kee Rules. Black's optimal play for would be an appealing pass play. can only capture the 2nd ko. can only capture the 3rd ko. White's optimal play for would be a non-appealing pass play. Black's optimal play for would be to capture the 1st ko. can only be an appealing pass play. can only capture the 2nd ko. can only capture the 1st ko. Finally, both players have no choices but to pass to end the game, leaving Black capturing two out of three ko's. can only capture the 3rd ko. Black's optimal play for would be a non-appealing pass play. can only capture the 1st ko. can only capture the 2nd ko. can only pass. Black 11 ( ) can only capture the 3rd ko. can only capture the 2nd ko. can only capture the 3rd ko. can only pass. Black 11 ( ) can only capture the 1st ko. To conclude, under Kee Rules, the optimal solution for triple ko with both players having one eye should be "Black capturing two out of three ko's". This is a position similar to a ten thousand year ko. White takes the ko, but after Black passes White should not fill. With normal ko rules, Black's recapture is prohibited and the game will end there. It is not fair to Black as White does not resolve the ko when Black is prohibited to make a stone play due to the ko. Under Kee Rules, Black can make an appealing pass play. Then when White attempts to pass to end the game, he does not have a reason to appeal, so will be rescinded and it can only be a non-appealing pass play. Followed by Black's non-appealing pass play, the game would end without any outstanding ko. Starting from an empty board, can Black do better than a draw? With normal ko rules, Black's recapture is prohibited and the game will end with White winning by 2 points. This means should be a pass and the game is a draw. Under Kee Rules, Black can make an appealing pass play. If White makes a non-appealing pass play, will be rescinded and it can only be a non-appealing pass play. Followed by Black's non-appealing pass play, the game would end with Black winning by 2 points. White would not allow this. Therefore, after Black's appealing pass play, White should not make a non-appealing pass play but instead an appealing pass play as well. This is allowed because is prohibited as it repeats the outcome before . With two appealing pass plays, the game would end with White winning by 2 points. This again means should be a pass and the game is a draw. With normal superko rules, Black would win by 1 point. I am going to show that the game is a draw under Kee Rules. Suppose Black is greedy with . White responds by , capturing the two black stones. Then capturing the one black stone would result in both players making an appealing pass play to end the game. White wins by 4 points. Then White's optimal play for would be a stone play to capture the one black stone. Then can only capture the three white stones. And can only occupy the other corner. can only make an appealing pass play, because capturing the two black stones would repeat the board position produced by . Then Black 11 ( ) can only capture the one white stone, because Black cannot make an appealing pass play to end the game without any immediate cycle prohibition. Then White 12 ( ) can only capture the three black stones. However, Black 13 cannot occupy the other corner because it repeats the board position produced by . Black 13 can only be a pass. Then White 14 ( ) can occupy the other corner to become permanently alive. White wins by 4 points. This time can capture the two black stones. White's optimal play for White 12 would be an appealing pass play. Capturing the one black stone would repeat the board position produced by White 6. Black 13 ( ) would then capture the two white stones. White's simpler play for White 14 would again be an appealing pass play. Occupying the upper right corner would repeat the board position produced by Black 9. White 16 ( ) can only capture the three black stones. However, Black 17 cannot occupy the other corner because it repeats the board position produced by White 8. Black 17 can only be a pass. White 18 ( ) can occupy the other corner to become permanently alive. White wins by 4 points. White 16 ( ) can only capture the three black stones. This time Black 17 ( ) can take the other corner. White's optimal play for White 18 ( ) would be a stone play to occupy the lower left corner. Black 19 ( ) can only capture the two white stones. White's optimal play for White 20 ( ) would be a stone play to occupy the upper left corner. 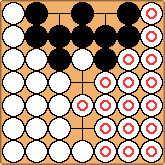 Black 21 can only be a pass as capturing the one white stone would repeat the board position produced by Black 15. White's optimal play for White 22 ( ) would be a stone play to capture the two black stones. If Black 21's pass play is non-appealing, then Black 23 ( ) to occupy the lower right corner is allowed even if it repeats the board position produced by White 18. However, White 24 can simply be a non-appealing pass play and the game would end there, as Black 25 to capture the two white stones would repeat the board position produced by Black 19. In this case, White would win by 1 point. If Black 21's pass play is appealing, then Black 23 ( ) would either be an appealing pass play or a stone play occupying the upper right corner as shown here. No matter what, White 24 would eliminate any black stones, leaving only three white stones on the board. Then Black 25 ( ) can only capture the three white stones. And White 26 ( ) can only occupy the other corner. Then White 28 can only be an appealing pass play, because capturing the two black stones would repeat the board position produced by White 22. Black 29 ( ) can only capture the one white stone. Then White 30 ( ) can only capture the three black stones. However, Black 31 cannot occupy the other corner because it repeats the board position produced by White 26. Black 31 can only be a pass. White 32 ( ) can occupy the other corner to become permanently alive. White wins by 4 points. Then White 28 can only capture the two black stones. Then White 30 can only capture the three black stones. The game would end here because both players can only make an appealing pass play. White wins by 4 points. White's optimal play for White 30 would be an appealing pass play. Capturing the one black stone would repeat the board position produced by White 24. Black 31 ( ) can only capture the two white stones. White's simpler play for White 32 would again be an appealing pass play. Occupying the lower left corner would repeat the board position produced by Black 27. Then White 34 ( ) can only capture the three black stones. However, Black 35 cannot occupy the other corner because it repeats the board position produced by White 2. Black 35 can only be a pass. White 36 ( ) can occupy the other corner to become permanently alive. White wins by 4 points. Then White 34 ( ) can only capture the three black stones. However, Black 35 cannot occupy the other corner because it repeats the board position produced by White 26. Black 35 can only be a pass. Then White 12 ( ) can only capture the one black stone. Then Black 13 ( ) can only capture the three white stones. And White 14 ( ) can only occupy the other corner. White's simpler play would be an appealing pass play. Capturing the two black stones would repeat the board position produced by White 10. Black 17 ( ) can only capture the one white stone. Then White 18 ( ) can only capture the three black stones. However, Black 19 cannot occupy the other corner because it repeats the board position produced by White 14. Black 19 can only be a pass. White 20 ( ) can occupy the other corner to become permanently alive. White wins by 4 points. This time White 16 ( ) can capture the two black stones. White's optimal play for White 18 would be an appealing pass play. Capturing the one black stone would repeat the board position produced by White 12. Then Black 19 ( ) can only capture the two white stones. White's simpler play for White 20 would again be an appealing pass play. Occupying the upper left corner would repeat the board position produced by Black 15. Then White 22 ( ) can only capture the three black stones. However, Black 23 cannot occupy the other corner because it repeats the board position produced by White 14. Black 23 can only be a pass. White 24 ( ) can occupy the other corner to become permanently alive. White wins by 4 points. Then White 22 ( ) can only capture the three black stones. This time Black 23 ( ) can occupy the other corner. Then White's optimal play for White 24 ( ) would be a stone play to occupy the lower right corner. Then Black 23 ( ) can only capture the two white stones. White's optimal play for White 26 ( ) would be again a stone play to occupy the lower right corner. Then White 28 ( ) can only capture the three black stones. 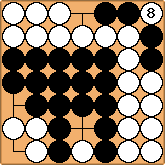 However, Black 29 cannot occupy the other corner because it repeats the board position produced by White 2. Black 29 can only be a pass. White 30 ( ) can occupy the other corner to become permanently alive. White wins by 4 points. Then White 28 ( ) can only capture the two black stones. Then White 30 ( ) can only capture the one black stone. The game would end here because both players can only make an appealing pass play. White wins by 4 points. However, White 30 can simply be a non-appealing pass play and the game would end there, as Black 31 to capture the two white stones would repeat the board position produced by Black 25. In this case, White would win by 1 point. Then White 18 ( ) can only capture the one black stone. Then Black 19 ( ) can only capture the three white stones. And White 20 ( ) can only occupy the other corner. Then White 22 can only make an appealing pass play. Capturing the two black stones would repeat the board position produced by White 16. Then Black 23 ( ) can only capture the one white stone. Then White 24 ( ) can only capture the three black stones. However, Black 25 cannot occupy the other corner because it repeats the board position produced by White 20. Black 25 can only be a pass. White 26 ( ) can occupy the other corner to become permanently alive. White wins by 4 points. Then White 22 ( ) can only capture the two black stones. Then White 24 ( ) can only capture the one black stone. The game would end here because both players can only make an appealing pass play. White wins by 4 points. White's optimal play for White 24 would be an appealing pass play. Capturing the one black stone would repeat the board position produced by White 18. Then Black 25 ( ) can only capture the two white stones. White's simpler play for White 26 would again be an appealing pass play. Occupying the lower left corner would repeat the board position produced by Black 21. Then White 28 ( ) can only capture the three stones. However, Black 29 cannot occupy the other corner because it repeats the board position produced by White 2. Black 29 can only be a pass. Then White 28 ( ) can only capture the three stones. 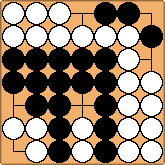 However, Black 29 cannot occupy the other corner because it repeats the board position produced by White 20. Black 29 can only be a pass. To conclude, under Kee Rules, the optimal solution for 2×2 board should be a draw. With normal superko rules, the game is a draw. I am going to show that the game is also a draw under Kee Rules. Suppose Black is greedy with . White responds by , capturing the three black stones. After , White's optimal play for would be a non-appealing pass play. After (assuming it is on the left, without loss of generality), White's optimal play for would be a stone play to capture the two black stones. After Black 11 ( ), White's optimal play for White 12 ( ) would be a stone play to capture the one black stone. Since capturing the five white stones would repeat the board position produced by , Black can only make an appealing pass play. After that, White can make an appealing pass play to end the game because a stone play would be a suicidal and it repeats the outcome before . With two appealing pass plays, the game would end with White winning by 6 points. This again means should be a pass and the game is a draw.